The state has “move[ed] to dismiss Plaintiffs’ Complaint for lack of standing and for failure to state a claim upon which relief can be granted.” This particular legal motion can sometimes be quickly successful as a defense. Courts don’t strike down laws just because some parties don’t like the law, even when the law itself is widely held to be defective, unconstitutional, terrible policy, etc. Typically the plaintiffs need to be allege some tangible harm in order to have standing to sue, e.g., such as being arrested. Wyoming claims to the court that the plaintiffs do not allege any real harm to themselves. If the case clears this hurdle of standing, it is hard to see how it can then survive the scrutiny of federal court. On the surface it seems to violate numerous provisions in the U.S. Constitution and others things too, not asserted by the plaintiffs, such as vagueness and ambiguity. These are two aspects of laws that courts usually hate. There is no doubt that Western Watersheds Project (WWP) has had their data collection program which is aimed at protecting and restoring Wyoming waters harmed. WWP has shut down data collection in Wyoming in order to avoid arrest. In many ways Wyoming’s law is similar to Idaho’s ag gag law, which was recently declared unconstitutional by Idaho’s federal judge Lynn Winmill. See Animal Legal Defense Fund, et al. v. Otter. Winmill’s opinion was a strong rejection of Idaho’s overreaching law. Despite anger in the Idaho legislature, a survey found most Idahoans approved of the judicial killing of this ag gag by 53% to 32%. Wyoming differs in that it creates a new kind of trespass, that of trespassing to collect data. Data is broadly defined. It includes photos under its legal shadow. 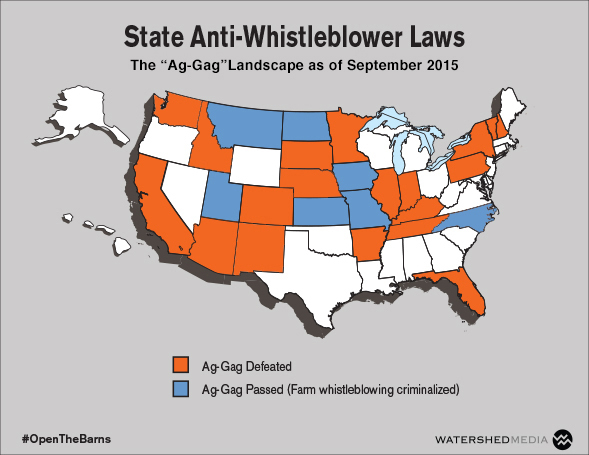 Many states have passed ag gag laws, but they are rarely enforced. This is probably because doing so would give the party arrested clear standing to sue. Ag gag functions mostly to “chill” activities — to make people afraid to investigate what they think are agricultural abuses. These are usually abuses related to livestock rather than other kinds of agriculture. Lack of enforcement does make suing against the ag gag law more difficult. Utah passed an ag gag law in 2012. It is finally being challenged in federal court. So, with three new lawsuits, and one already successful, ag gag laws might disappear. This possibility is not so likely, however. New forms of ag gag are even being developed. In Wisconsin, where everything Koch (bros) is in political style, a bill similar to ag gag but about hunting has been introduced. Like ag gag laws, it too is overreaching, likely chilling many more activities than just those of the group Wolf Patrol, the main target of the bill. It is easy to see that a major characteristic of all these bills is that they are passed with intense anger and little thought about their constitutionality. The lawmakers shoot with a shotgun, so to speak, rather than a laser. Courts don’t like this kind of lawmaking, especially when it involves fundamental rights like free speech. The legislators usually make little secret of how they demonize their opponents and that they intend to shut them down. Judge Winmill made hostile language expressed in the legislature’s debate a major point in his Idaho ag gag decision. Judge Winmill wrote the following rejecting the State of Idaho’s defense that they were not failing to provide equal protection under the law for those critical of agricultural practices. The overwhelming evidence gleaned from the legislative history indicates that § 18-7042 was intended to silence animal welfare activists, or other whistleblowers, who seek to publish speech critical of the agricultural production industry. Many legislators made their intent crystal clear by comparing animal rights activists to terrorists, persecutors, vigilantes, blackmailers, and invading marauders who swarm into foreign territory and destroy crops to starve foes into submission. Other legislators accused animal rights groups of being extreme activists who contrive issues solely to bring in donations or to purposely defame agricultural facilities. To some degree these laws probably function to let state legislators let off steam. The American right wing has been criticized by some as being more of an emotional expressive movement than one bent on making serious policy changes. 8 Responses to Can ag gag be strangled? “Lack of standing” and other high sounding phrases is legal BS. The few, powerful and wealthy terrorist want capitalism to work for them and not the weak and many. Wisconsin is also currently trying to push through a law similar to ag-gag; anyone caught taking pictures of hounders, hunters, or their baits can be criminalized, even if the subject of their pictures were in violation of game laws. This is a fine example how stupid and mean laws, unconstitutional laws, are being spread. Mr. Maughan, The WI.Committee on Natural Resources & Sporting Heritage initiated a notice for a public hearing to WI. Assembly Bill 433-Interfering with Hunting,Fishing and Trapping and providing criminal penalties can be viewed in it’s entirety at: wisceye.org In my opinion point-blank Wisconsin’s political legislation is dysfunctional and Bill 433 is fallible. As is an untruth to be told of a hunter’s humble concealment of heritage and notoriety. “In multiple interviews, Ecology staff are very vague describing their interactions with the farmers, which they hint were pretty unpleasant. The reason becomes clear when I call the Snydar Farm for comment on the case. The woman who answers the phone – who would not identify herself – launches into an expletive-laced tirade about my having the nerve to call her about the issue.